New residency requirements have boosted Jofra Archer's chances of playing for England. Picture: Getty. England’s national selector Ed Smith insisted Jofra Archer’s name did not come up as his panel rubber-stamped two familiar-looking squads for the new year tour of the West Indies, but would not rule out a late dash for the World Cup. 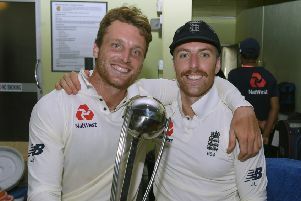 After sealing a memorable 3-0 whitewash in Sri Lanka there was little mystery around the 16-strong Test squad – with the same group that ended the series retained en masse. That meant no place for Surrey batsmen Ollie Pope and Jason Roy – the former having left Sri Lanka early to join the Lions in the United Arab Emirates while the latter continues waiting for a first opportunity in the longer format – and a reprieve for Kent’s Joe Denly. The 32-year-old retained his place as top-order cover for the three-match Test series, partially due to his versatility and ability to bowl leg-spin, and has also been included in a 15-man one-day international squad that does not feature recent pace recruit Olly Stone or slow left-armer Liam Dawson. In the absence of a Smith-inspired wildcard for the Caribbean, interest turned to Archer, the 23-year-old from Barbados who appears to be the chief beneficiary of the England and Wales Cricket Board’s recently revised eligibility rules. The Sussex paceman has built a formidable reputation on the domestic Twenty20 circuit and the governing body’s shift from a seven-year residency requirement to three years – one which brings it into line with other major cricketing nations – means Archer could emerge as a bolter ahead of next summer’s home World Cup. Although keen to stress Archer’s likely availability in March – it might have been earlier had it not been for his Hobart Hurricanes deal in Australia’s Big Bash – was not an agenda item at yesterday’s meeting at Lord’s, Smith was clear that could quickly change. “As it stands now, Jofra Archer was not available so we did not consider him for selection,” he said. “As a selector, you try to keep things as simple as you possibly can: who is available? Of those available, what’s the strongest possible squad? “If there are other players that become available and we think they’re worthy of consideration, we would consider them. England must name a provisional World Cup squad on 23 April and have only a standalone ODI in Ireland plus a five-match home series against Pakistan to finalise preparations for the tournament. It could be seen as a risk to throw a new face into a group that has blended with great success over the past three and a half years but there could conceivably be one seam-bowling spot up for grabs if Wood or the fit-again David Willey falter. Smith was eager to stress Pope’s demotion was less a statement on his suitability for the Test arena and more about the strength of competition in the middle order and also had encouraging words for Roy. He could yet find himself involved in the 2019 Ashes having been discussed several times for a red-ball call but must be patient. “Jason is very talented. We continue to watch his development as an all-round cricketer very closely,” said Smith. Ben Stokes and Alex Hales have both been named in the ODI squad less than a week after a disciplinary hearing into their roles in a fight outside a Bristol nightclub in 2017, with all-rounder Stokes also in the Test squad. Smith said: “Ben is obviously in all England formats and is one of our leading cricketers in this country. “Alex has been a central part of the white-ball team for a number of years. He’s currently missed out on selection at times but when he’s got his opportunities, he’s taken them. “So nothing has changed. They are available for selection, they have been selected and that’s the situation.